Having won the National Trust’s top award for ‘conservation of a built heritage’, and a UNESCO ‘Award of Distinction’ for Culture Heritage Conservation in the Asia-Pacific Region the National Pass reconstruction has become one of, if not the best achievement in heritage conservation in Australia. 2008 marks the centenary of the construction of the National Pass, the Blue Mountains most popular bushwalking track, a two and a half kilometre ‘engineering feat’ which clings to a narrow ledge halfway up a 250 metre cliff face. The masterpiece of the heritage listed track is The Grand Stairway; steps that have been cut down a 90 metre cliff face descending to the ledge and to access the middle tier of Wentworth Falls. The entire track was the brainchild of a Scottish sea captain, JAMES SOMERFIELD MURRAY who, in 1906, led a small team of men called ‘the Irish Brigade’, who for two years constructed the National Pass. ‘Rumour has it’, says NPWS Ranger Ben Correy, ‘that Captain Murray was lowered over the cliff in a bosun’s chair’, in order to survey the cliff and access the ledge to construct the track using dynamite, picks and shovels. After a century of floods, landslides, and bush fires the track has been restored to its former glory, and improved upon with an equally heroic effort from today’s team of track workers under the leadership of master trackbuilder Colin Delap. 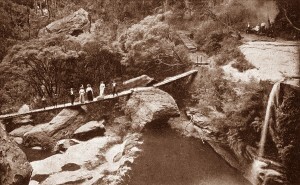 The re-construction effort brought forth a whole range of difficulties unique to the location, particularly the problem of how to build a bridge across Wentworth Falls that will withstand the forces of major floods, where all previous bridges have been swept away. Colin’s answer is ingenious and innovative, drawing on his European heritage in stonemasonry and heritage track construction. His new bridge is the masterpiece of the re-construction. the consolidation and reconstruction of steps, bridges and staircases using local materials and traditional building techniques demonstrate excellent craftsmanship, ensured the historic continuity of the walking track and reconfirmed the relationship between nature and humankind. This entertaining and sometimes breathtaking film follows Colin Delap, Ben Correy and historian JIM SMITH, as they take us along the track, pointing out the unique challenges of the original construction and re-construction. The film includes historic photos, reconstructed ‘historic’ footage and scenes of the National Pass that make you want to get out there and experience it for yourself. Visit the National Pass Website.